During flea season, dog owners will try anything to find relief for their furry friends. However, many owners do not like the idea of dousing their pets in chemicals or insecticides. Fortunately, there are many natural remedies available, including those using essential oils, like peppermint. These flea remedies are safe for dogs, can be used often and are effective at treating fleas. One bonus is that your dog's coat will smell clean and fresh after you douse him with an herbal flea remedy. Unfortunately, cats have a difficult time metabolizing essential oils and some even have allergic reactions to them, so these remedies should not be used on your cat. To rid your dog of fleas you can start with a homemade flea-dip. If prepared properly, the dip will kill fleas, flea eggs and flea larva, and them from coming back. The dip should also help soothe your dog's itchy skin. Combine the water and peppermint, and steep for 30 minutes, then let cool. After it has cooled, bathe your dog in the solution. This can be repeated every two weeks as needed. The flea repellent spray is useful when you do not have time to give your dog a full flea bath or when you want to touch up your dog's flea protection, between baths. This spray can be applied daily. Combine the oils and water into the spray bottle and shake it vigorously. Spray around your dogs ears, along its spine from head to tail and in the pit area, where the legs meet the body. Shake the bottle before each use, as the oils will have separated. Flea collars are one of the easiest methods of flea prevention, but many dog owners do not like the idea of hanging a chemical-soaked collar around their pet's neck.You can solve this dilemma by making herbal flea collars for your dog. Just rub a little essential oil on your dog's collar, such as eucalyptus, tea tree, citronella, lavender, peppermint or geranium. 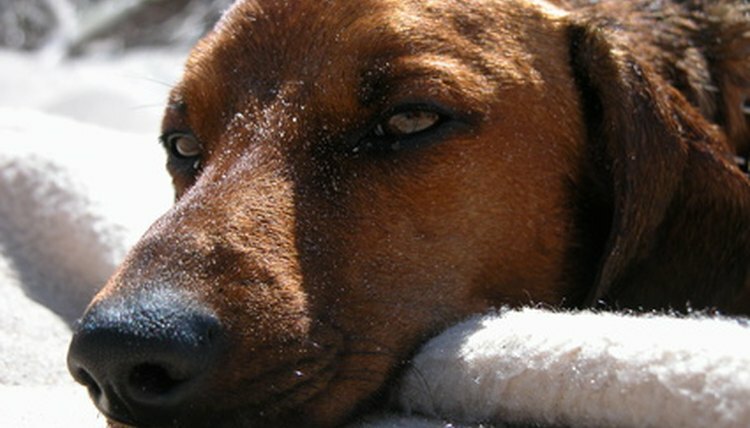 If the fleas are gone but your dog is still itching, try making this itch remedy. Steep the herbs in boiling water for 30 minutes, then strain the herbs from the water. Combine the hot water with the warm water, then completely saturate your dogs coat with the mixture. Let your pet air dry. This itch remedy can be safely repeated every three or four days. Dr. Bronner's Peppermint Soap can be used to create an insecticide that works well on your dog, yourself and your garden, by repelling a variety of pests. Combine ingredients in a bucket, mix together, then transfer to a spray bottle. Use it to repel garden pests, fleas and anything else you do not want bothering you or your dog while outside. Kate Jennings has been a journalist since 2008. Her work has appeared in "Kentucky Magazine," "Kentuckiana Family," "The Courier-Journal," "The Trail Blazer," the "Mt. Sterling Advocate," and the "Maysville Ledger-Independant." Jennings has won numerous Kentucky Intercollegiate Press Association awards. Currently, she is studying journalism and art history at Morehead State University.